Is Michelle Obama suddenly single? A slip of the tongue revealed that first lady Michelle Obama may be a bit lonely in the White House while her husband slaves away in the Oval Office. Michelle Obama was a swingin' single this morning — for a hot second, anyway. The first lady had a little slip of the tongue during an interview with a local CBS station today, turning herself into a single mom! FLOTUS was chatting with WCAX of Vermont about her "Let's Move" initiative when she made the embarrassing flub. "Believe me, as a busy single mother — or, I shouldn't say single, as a busy mother," she quickly corrected herself. "Sometimes, you know, when you've got a husband who is president, it can feel a little single," she joked. "But he's there." President Obama actually makes a point of at least sitting down to dinner with his family every night in the White House private quarters before returning to the Oval Office to burn the midnight oil. Before they came to Washington though, Michelle Obama had a high-powered career of her own and shared the same struggles as any mom who works outside the home. "But as a busy working mom, and before coming to the White House, I was in that position, you know, as well," she said. "Working, driving kids to practice, you know not having enough time to shop or cook, not having the energy… resources weren't the issue but time and energy is key." 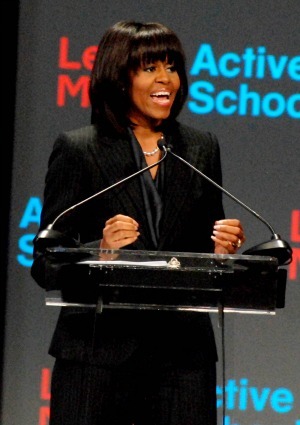 The "Let's Move" initiative that Mrs. Obama is promoting aims to give kids in underserved or underprivileged areas access to healthier food and help them become more active. She's not afraid to get her hands dirty herself. On Wednesday, she and students from around the country planted veggies in the White House Kitchen Garden for the fifth year in a row, to be used in meals for the First Family and White House guests as well as being donated to local charities.